The usual rhetoric has now taken over Israel – another war against Gaza, and against Hizbolah is required… Officer are giving interviews about preparation like there is no tomorrow (well, there isn’t, really… they always go back to yesterday) and all are happy that the conflict with Iran is on the way. One can be easily overwhelmed by such happiness. Israel strikes Gaza in response to fire, killing one; Iron Dome missile defense system intercepted seven rockets heading toward Ashkelon. Militants in the Gaza Strip fired at least 52 rockets and mortar shells at southern Israel early Wednesday, leaving three people wounded. The rockets and morters struck areas in the Eshkol Regional Council, Sha’ar Hanegev and the Ashkelon coast. Three migrant workers were hurt, two of them them seriously and one lightly. Several houses in the Eshkol Regional Council and Sha’ar Hanegev sustained damage in the attacks. Residents have been asked to remain in bomb shelters, and classes have been canceled in Eshkol and Sha’ar Hanegev. The Iron Dome missile defense system intercepted seven rockets heading toward Ashkelon. Hamas officials also reported Israeli tanks firing into Gaza. A military spokesman confirmed that report. Earlier Wednesday, the Israel Defense Forces attacked a rocket-launching squad in southern Gaza, near the Rafah crossing, who had just fired at Israel, the IDF spokesman said in a statement. The Israel Air Force carried out a strike on targets in the northern Gaza Strip late Tuesday, after eight mortar shells were fired into southern Israel several hours earlier. IDF officials said that they carried out two strikes on terrorist cells planning to launch more rockets into Israel in northern Gaza on Tuesday night. Hamas said that three operatives were killed and another three wounded in the strikes. Also Tuesday, an Israel Defense Forces officer was seriously wounded during a military operation near the security fence on Israel’s border with the Gaza Strip. The army confirmed that the officer was wounded in an explosion. Though the cause of the blast is still unclear, the army suspects that the officer was wounded after a roadside bomb exploded in the area. In the past, roadside bombs have been used to target IDF forces patrolling the security fence. More than two-thirds of Israeli Jews say that 2.5 million Palestinians living in the West Bank should be denied the right to vote if the area was annexed by Israel, in effect endorsing an apartheid state, according to an opinion poll reported in Haaretz. A third want Arab citizens within Israel to be banned from voting in elections to the country’s parliament. Almost six out of 10 say Jews should be given preference to Arabs in government jobs, 49% say Jewish citizens should be treated better than Arabs, 42% would not want to live in the same building as Arabs and the same number do not want their children going to school with Arabs. The poll was conducted by a public opinion firm, Dialog, which interviewed 503 people out of an Israeli Jewish population of just under 6 million. 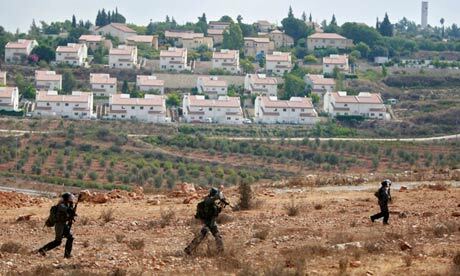 Talk of the possible annexation of the West Bank, or the main settlement blocks within it, has increased in recent months as expectations of a negotiated settlement to the conflict have sunk to an all-time low. Israel’s defence minister, Ehud Barak, recently argued for the annexation of land between the internationally recognised Green Line and the Israeli-built separation barrier. The poll results will bolster the claim of Israel’s Arab citizens, who make up 20% of the population, that they suffer from racist discrimination. Almost half the poll’s respondents said Israeli Arabs should be transferred to the Palestinian Authority, and a third said that Arab towns in Israel should be moved to the PA’s jurisdiction in exchange for Jewish settlements in the West Bank. According to the Haaretz report, the survey found that ultra-Orthodox Jews held the most extreme views about Arabs, with 70% supporting a legal ban on voting rights and 95% backing discrimination against Arabs in the workplace. “The IDF will not tolerate any attempt to harm Israeli citizens and security forces and work against anyone initiating terror against the state of Israel,” a written statement issued by the IDF said, adding that Israel holds Gaza’s Hamas rulers responsible, it said. Prime Minister Benjamin Netanyahu said Israel would deliver a strong response to the attack. “We will fight and we will hit them very, very hard,” Netanyahu said. We could argue over who killed it, but what’s the point? It’s increasingly obvious that a continued insistence on zombie peace talks between Israelis and Palestinians is deluded, because the two-state principleframing them is dead. To précis: it’s now impossible to remove half a million Jewish settlers and infrastructure from the occupied West Bank and East Jerusalem; the international community is opposed to settlements on paper but does nothing in practice, and after 19 years of failed two-state talks, the fault plainly lies in the plan, not the leadership. Alongside that, we’re starting to see the practical consequences of those Jewish settlers who, surprisingly, started talking about one-state approaches two years ago. 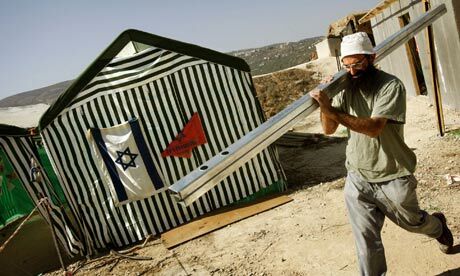 Last week, a Palestinian village in an Israel-controlled area of the West Bank was given building permits – the first time that’s happened during a 45-year Israeli occupation – thanks to petitions from their Jewish settler neighbours. Meanwhile, rightwing Israeli politicians such as Knesset speaker Reuven Rivlin and ex-defence minister Moshe Arens have been arguing for one state – and while their vision isn’t premised on immediate equal citizenship, they have taken the sting out of the subject. Among Palestinians, support for a one-state approach is also growing. A poll last month showed that support for a one-state formulation premised on equal rights has inched up among both Palestinians and Israelis. In the West Bank, there are fresh peaks of disillusion with the Palestinian Authority – whose tenure was always supposed to be temporary, pending statehood, as set out in the Oslo Accords. Unelected, tainted by corruption, aid-dependent and viewed as enforcers of the Israeli occupation, the PA’s last stab at credibility was probably its statehood bid at the UN last year. But you could practically hear the hope hissing out of that media-inflated bid when, pressured by the US, Palestinian president Mahmoud Abbas switched to a hollowed-out version that was meaningless and destined to fail. Now a new generation of Palestinian activists, in part inspired by the Arab uprisings in the region, are bypassing territorial demands to focus on civil rights and freedoms. In Israel, there are green shoots of debate around practical questions of how to share the space between the Mediterranean and the Jordan River. Weeks ago, Israeli analyst and blogger Dahlia Scheindlin – previously a two-state advocate – set out a list of key questions and suggestions, concerning issues such as national symbols, voting systems, refugees and land rights. Already, Israeli intellectuals are working out the idea that Jewish claims to the region – currently enforced with guns and walls – would need instead to be enshrined by law, alongside equally guaranteed Palestinian protections. In his new book, Beyond the Two State Solution, Israeli sociologist Yehouda Shenhav draws on a pre-Israeli, bi-national strain of Zionism that was historically drowned out but should now, he argues, be reclaimed. Countering a common criticism of one-state proposals, these emerging formulations don’t insist that Palestinians and Israelis give up outdated attachments to nationalism – which is helpful, because it seems that neither side wants to, yet. A small group of Palestinians, Israelis and Jewish settlers, Eretz Yoshveyha – “land of its inhabitants” – set out “principles for a single spatial polity” last year, among them safeguarding the collective rights of the two nations. One settler tells me of a consensus emerging within nascent, one-state settler groups that, while national identity may be important, exclusive Jewish sovereignty is not. It’s all germinal and there are problems, of course. Most polled Palestinians and Israelis still support a two-state framework, even while at the same time believing it doomed. Shared-space alternatives have grassroots momentum, but no leadership support. The left needs to ensure that Gaza remains part of the picture. And doubtless some West Bank settlers support one-stateism as a way of avoiding potential eviction, with scant regard for Palestinian rights. A recent poll suggests Israelis agree, with a majority supporting discriminatory policies if the West Bank were annexed. Tentative meetings between settlers and Palestinians could crash once they progress beyond relatively safe, community issues – a belief in the power of people sitting together over apolitical cups of tea was a theme tune of the peace process years, and look how that turned out. But one idea is crystallising: that clinging to a two-state approach is, by default, a victory for the far-right claims of one state called “Greater Israel”, with a Jewish minority and two, ethnically coded tiers of rights and freedoms. That’s the reality on the ground, cemented by Israel while paying lip-service to the idea of Palestinian statehood. Now the Israeli government wants to consolidate this even further, through approval of a report that declares all settlements legal under international law – enshrining the idea that the West Bank isn’t occupied. In this context it’s heartening that peace camps on both sides are starting to break a period of paralysis, discarding the spent husks of the Oslo phase to claw back fresh thinking space. It’s only when freed from the dead weight of a two-state paradigm that a just, dignified and peaceful solution has the chance to flourish. 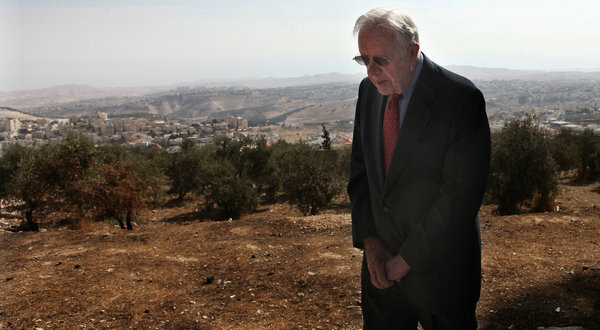 Former President Jimmy Carter in Jerusalem on Monday. He is visiting on behalf of the Elders, a left-leaning human rights group. Mr. Carter was here with the former prime minister of Norway, Gro Harlem Brundtland, and the former president of Ireland, Mary Robinson, on behalf of the Elders, a group of 10 left-leaning éminences grises convened by Nelson Mandela in 2007 that aims to promote human rights and world peace by, according to its Web site, “speaking difficult truths and tackling taboos.” Mr. Carter and Ms. Brundtland met with President Shimon Peres ofIsrael on Sunday, and all three met with President Mahmoud Abbas of the Palestinian Authority on Monday, consulting in between with like-minded Palestinian and Israeli intellectuals. On Wednesday, they are scheduled to see Egypt’s new Islamist president, Mohamed Morsi.